Looking for carpet tiles in Melbourne? Hartnett Flooring has what you need. Serving customers in the residential and commercial industry for many years, we’ve built a reputation for quality brands, best prices, and great service. We supply a wide range of carpet tiles in varying styles to suit any application. Our carpet tiles are of the highest quality and sourced from the industry’s most trusted manufacturers. We offer the most competitive prices in Melbourne and have extensive experience install carpet tiles in both commercial and residential projects. We take the same pride in installing carpet tile floors that we are known for with our hardwood flooring services. Carpet tiles are easier and more cost effective to install, causing less disruption to your business. Carpet tiles give you the warmth and comfort of carpet without the worry of accidents permanently staining your floor. Your carpet tiles may be individually removed for spot cleaning or replacement when accidents occur. 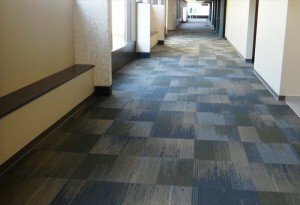 Commercial carpet tiles are designed specifically for high traffic flooring; they can be moved from high traffic areas to more moderate traffic areas, maximizing wearability and appearance retention. Easy access to floor mounted computer and electrical outlets eliminate the need to disturb the entire carpeted surface area. Conventional roll carpeting does not allow this flexibility. Damaged or soiled carpet tiles may be easily removed by simply replacing the affected carpet tile with a fresh tile. The possibilities are endless. Use your imagination to create your own unique designs. Choose from the latest Designer Created patterns and colours available in our Stunning New Carpet Tile Selections. Maintenance is Simple, Quick, and Easy. Vacuum regularly, blot spots and spills as quickly as possible, then flush with cool water. It’s that Easy. No special cleaning or chemical treatments required.